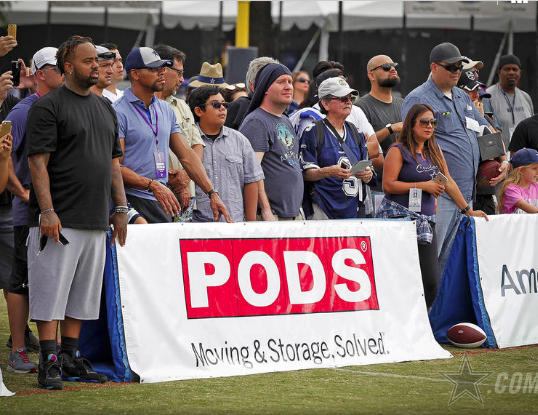 Two large PODS® Containers were placed at the training camp to store the dry food items, soft drinks and water for sale to benefit Oxnard Union High School’s football programs, as well as items necessary to maintain the camp operations. Proceeds from the camp fundraiser will help pay for football equipment, spirit apparel, snack bar equipment, and other items. Our owner, Steve Yapp, hosted a company’s 10 year milestone bash showering several leading non-profits with more than $10,000 in donations. Yapp’s PODS® franchise worked in partnership with the Camarillo, Oxnard and Ventura Chambers of Commerce, and an overwhelming attendance of 500 community and business leaders came out to the fundraiser for five local charities: FOOD Share, Casa Pacifica, The City Center, Ventura County Rescue Mission and Big Brother Big Sisters. 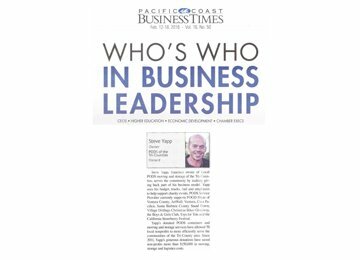 We’re thankful to be featured in the Pacific Coast Business Times Who’s Who in Business Leadership. 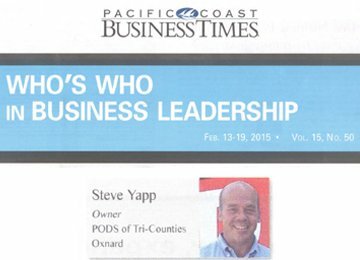 Local PODS® owner, Steve Yapp, has given back to the community for 10 years. We look forward to continuing to be a part of progressive and innovative changes in the Tri-County area and keeping our community ties stronger than ever before. 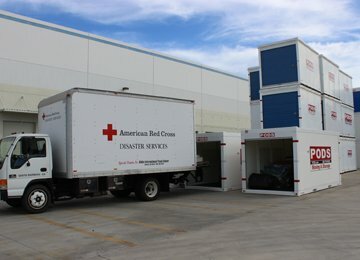 Local PODS® is helping the American Red Cross of Ventura County prepare for the upcoming El Nino storm by donating the use of its PODS containers. 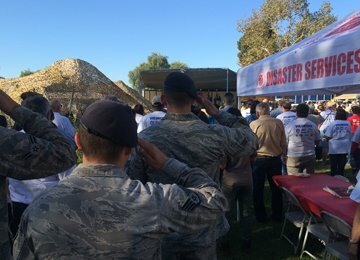 The American Red Cross of Ventura County is prepared for any possible storm scenario, such as flash floods, flooding or mudslides due to hefty weather conditions and with the help of PODS, it will help make the national organization’s job much easier. We teamed up with Ventura County’s most popular running event, the Santa to the Sea ½ Marathon and 5K, to collect unwrapped toys for the 12th annual Santa Claus Park toy giveaway. 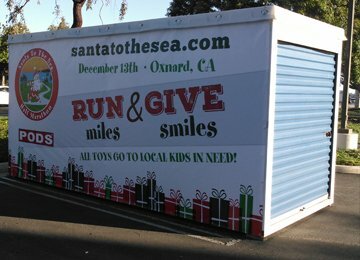 On race day, the donated PODS® containers served as the official “Santa’s Sleigh” and securely stored almost 4,000 toys donated during the event. PODS® is happy to support and carry the heavy weight to help Ventura County’s regional food bank, FOOD Share to have a successful holiday food drive CAN-tree Collection event. 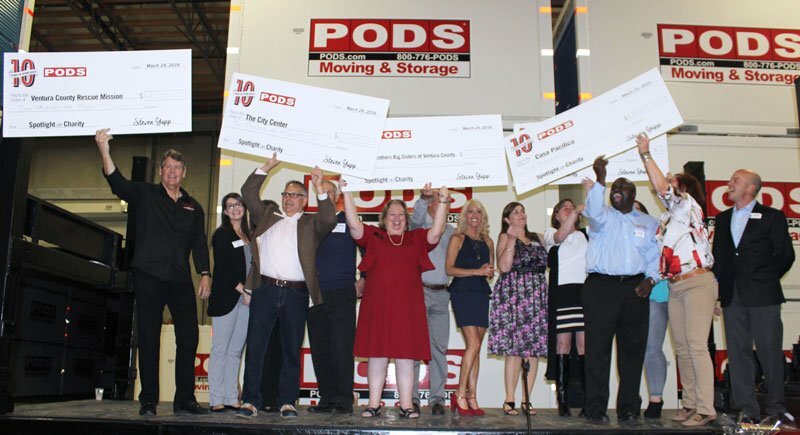 On Dec. 4-6, PODS helped transport more than 200,000 canned goods in PODS® containers to the site of the food drive at The Collection at RiverPark. 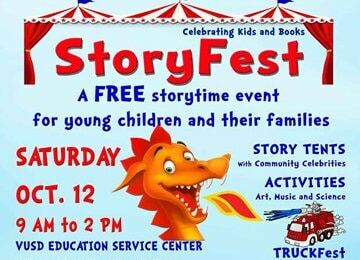 PODS® gave its services to Ventura Education Partnership and Ventura Neighborhood for Learning’s 9th Annual StoryFest promotes early literacy amongst children and their families while preparing them for school. 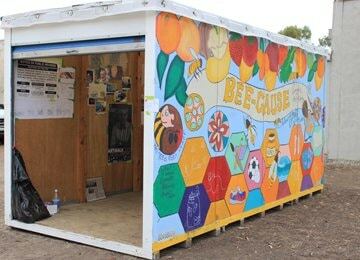 Our donation of a PODS Container will allow the Ventura Education Partnership to store more than 1800 books for distribution at the event. For the many veterans who are left without the daily amenities that so many people take for granted. 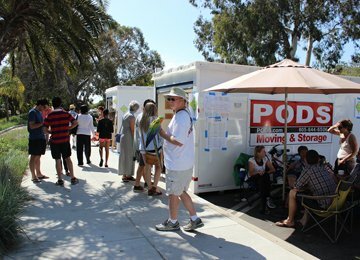 We are lending a hand-up by donating the use of our PODS® Containers to Santa Barbara County’s “Veteran Stand Down.” For the month of October, a PODS Container was placed at Santa Maria Fairpark to serve as a collection point for their weekly clothing and hygiene products that were donated. 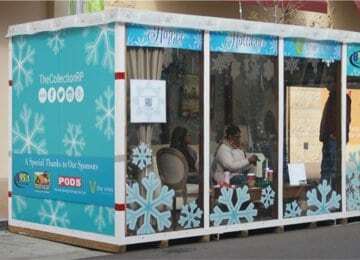 Fifteen PODS® Containers will be transformed into mini art exhibits that will connect local artists and galleries throughout the streets of Downtown and Ventura’s Westside Cultural District for Ventura’s signature event, ArtWalk. We donated PODS® Containers to Cal Poly San Luis Obispo’s PolyHouse project for the second year in a row. PolyHouse is a community service project led by the project management students at Cal Poly where they renovate the home of a deserving family. 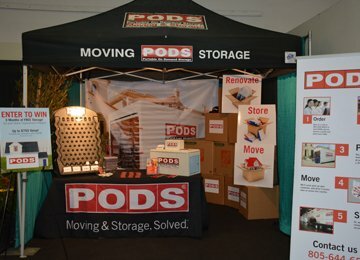 Local PODS® joined other exhibitors for the 23rd Annual Ventura Home and Garden “Spring” Show. 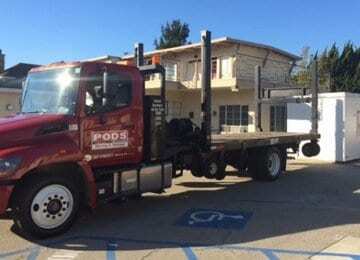 Local PODS® teamed up with the Turning Point Foundation, Veterans Administration, and The City Center, a transitional housing center, to temporarily house 14 homeless vets and their families in Ventura. PODS® is changing the way people not only move, but renovate, build and take on new life adventures by providing convenient and safe moving and storage solutions. Copyright © year PODS®of Tri-Counties. All rights reserved. PODS® is a registered trademark of PODS Enterprises, Inc.
Website Designed by Consortium Media.